Delheim are picking Pinotage in their vineyards today as their Pinotage is picked as the best in Germany. 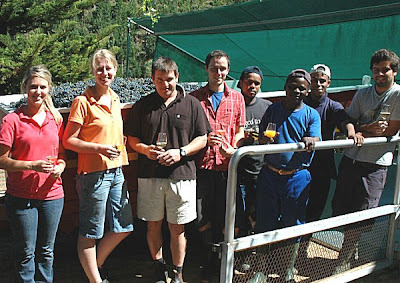 The picture above, taken this morning, shows Delheim's winemaker Brenda Van Niekerk (second left) and her cellar team standing in front of a hopper full of just picked Pinotage grapes about to be tipped into the de-stemming machine. Delheim co-owner Nora Sperling-Thiel says "the grapes are perfect for Pinotage Rosé." And it is Pinotage rosé that Delheim pioneered and have had great success with, further bolstered with the news this morning from Germany where trade magazine Weinwirtschaft reports that Delheim's was voted by the trade as the best rosé on the German market in 2007, beating all other rosés on quality, sales performance, value and image.